Kids have a new incentive to learn programming. Thanks to Code.org, they can design their own Flappy Bird game in 20 minutes. The “Make Your Own Flappy Bird” tutorial is designed for kids as young as six-year olds. It’s a great idea to leverage a popular game and tap into its global craze for teaching kids about the basics of programming. Children don’t even have to dive into intricate blocks of code and worry about functions, return values, loops and conditionals. It’s 20 minutes of fun. The Flappy Bird tutorial page gives you a fair idea how the learning progresses. It is interactive and the kids don’t need to have any prior knowledge about coding to move the blocks around. The drag ‘n drop method is excitingly kid-friendly and it is a teaching method that has been followed successfully by graphical coding tools like Scratch and Blockly. You can move the code blocks around to learn about events, event responses, and event handlers. But it doesn’t stop there, as kids can give free reign to their imagination and build their own Flappy Bird characters in the game with their own rules. For example, the “bird” can turn into a shark, Santa Claus or Superman, and can dodge lasers or turn into a turkey roast after being zapped. With the building blocks of computer programming in place, kids can then dive into more detailed lessons on the Code.org site, or anywhere else. 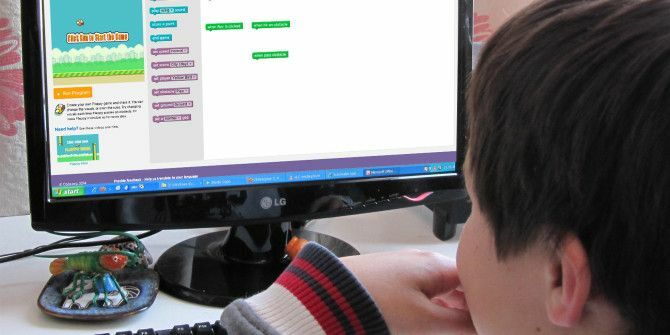 There are also plenty more fun tools to get kids excited about programming 10 Tools To Get Kids Excited About Programming 10 Tools To Get Kids Excited About Programming For the average kid, computers and smartphones are fun tools. Education comes much later. Getting a kid excited about programming might take some doing because logic needs a bit of time to develop. It is... Read More . Flappy Bird has flown off beyond the digital horizon. But its simplicity continues to inspire. If you are an adult, there’s nothing stopping you from testing the air with Make Your Own Flappy Bird. Is it fun? This is just a fun tool that's trying to leverage a topical game and make kids understand programming isn't necessary a dull subject. A school in my area spent 3 days on khan academy, then closed the lesson with this. This "game" progresses quite slowly, and uses code, but you're not actually programming. great stop complaining cos this is for younger people ! The game is just designed to sensitize little kids to the "basics" of cause of effect using a really popular game. Actual coding comes much later, as children pick up interest.